If you have been thinking that the public's general impression of lawyers is way too high, and would like to bring it down a few notches, here's an idea: for Halloween, dress up as some of the people you helped evict from their homes. A former employee of the Steven J. Baum law firm in New York recently sent this and some similar pictures to the New York Times, saying they were taken at last year's Halloween party. According to the report, the firm specializes in foreclosures and evictions and is the biggest such firm in New York. As you can see, the two employees in this picture are dressed like homeless people, presumably people their firm helped make homeless. Parts of the firm's office were set up to look like homeless camps. At first glance, it may seem like these employees dress in attire that mocks or attempts to belittle the plight of those who have lost their homes. But that's not what's going on here, according to a spokesman for the firm. "It has been suggested that some employees dress in … attire that mocks or attempts to belittle the plight of those who have lost their homes," the Times quoted him as saying. "Nothing could be further from the truth." Well, that's settled then. If there was something closer to the truth, though, he apparently didn't mention that thing in his statement. 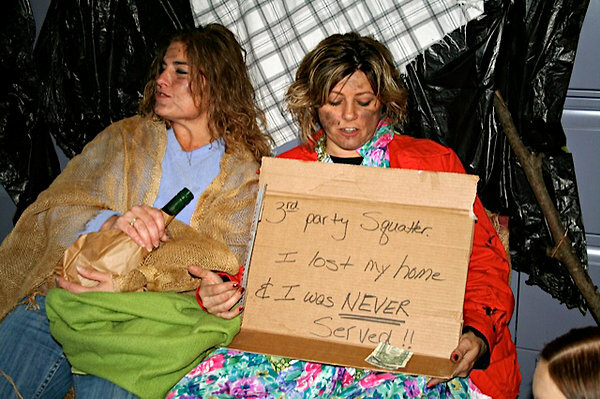 Now, I am not above making fun of a homeless person, although after running a few searches it appears that I never have. I did write this 2009 post about "Blanket Man," a homeless New Zealander who was arrested for indecent exposure but was released after agreeing to wear underpants under his blanket. But that was because of the odd bail condition, not the homelessness. (Also his lawyer's argument that the exposure wasn't intentional: "He wears high-risk clothing. It's a way of life rather than a deliberate attempt at lewdness." That one's never worked for me but this judge bought it.) Also, I did not assist in any way in putting Blanket Man out on the street to begin with. I don't think you engage in what's pictured above unless you're telling yourself that all homeless people necessarily deserve it, but nothing could be further from the truth.